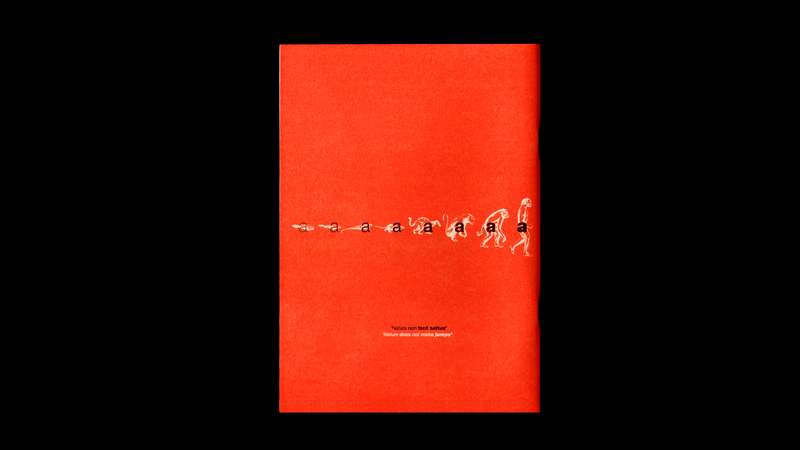 We are an outfit based in Singapore, offering art direction and graphic design services to commercial and cultural fields. 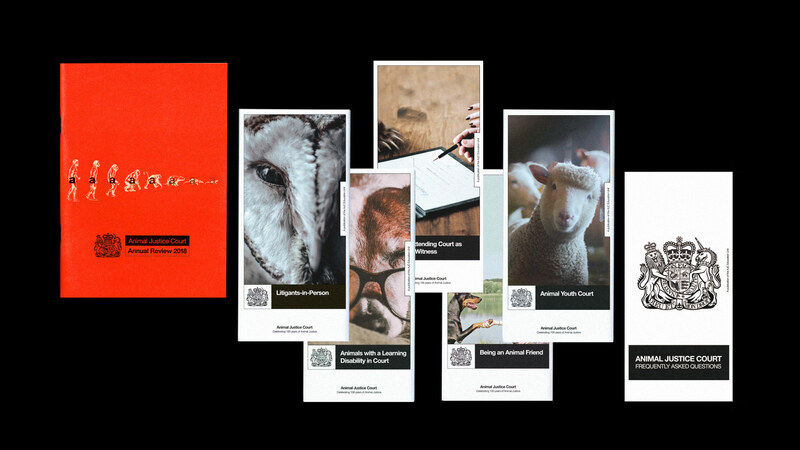 Working at the intersection of print and digital, we believe in an inquisitive approach for each and every project. 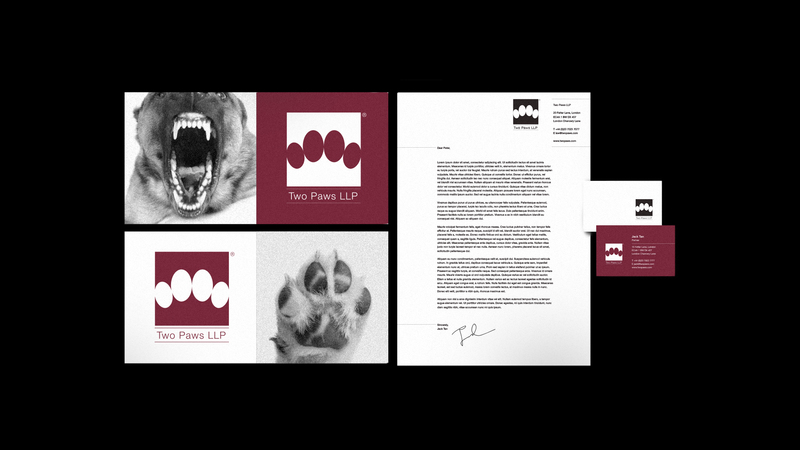 Contact us at mail@dariusou.work. 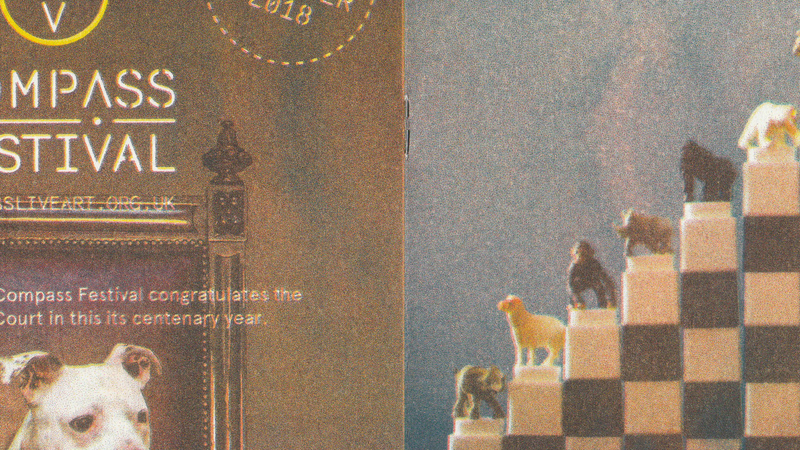 Follow us on Instagram. 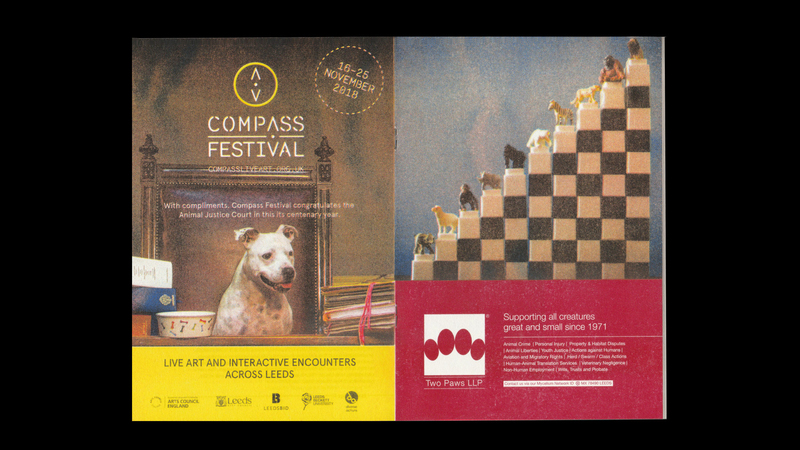 Four Legs Good is an artwork by Jack Tan for Compass Festival 2018 held in Leeds Town Hall, United Kingdom. 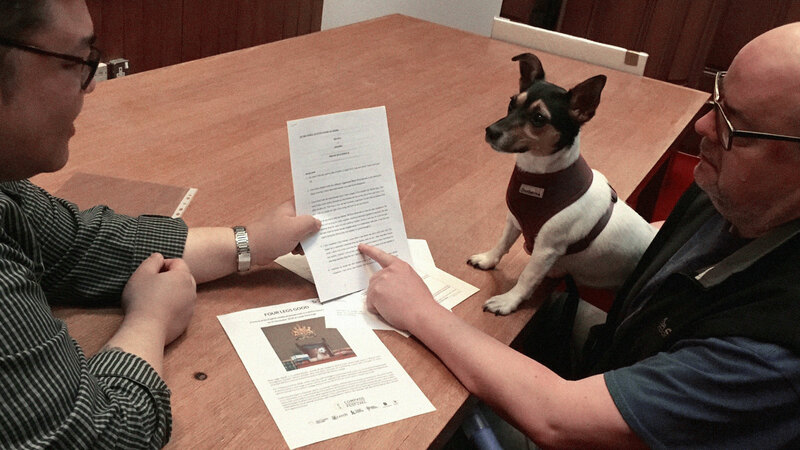 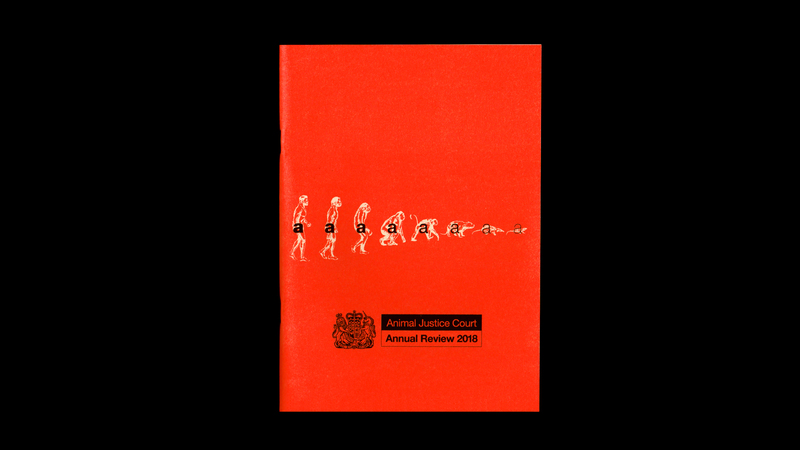 Based on the the medieval animal trials, Tan reimagines an alternate universe where animals could communicate with humans and had legal rights, resulting in a fictional court called the Animal Justice Court (AJC). 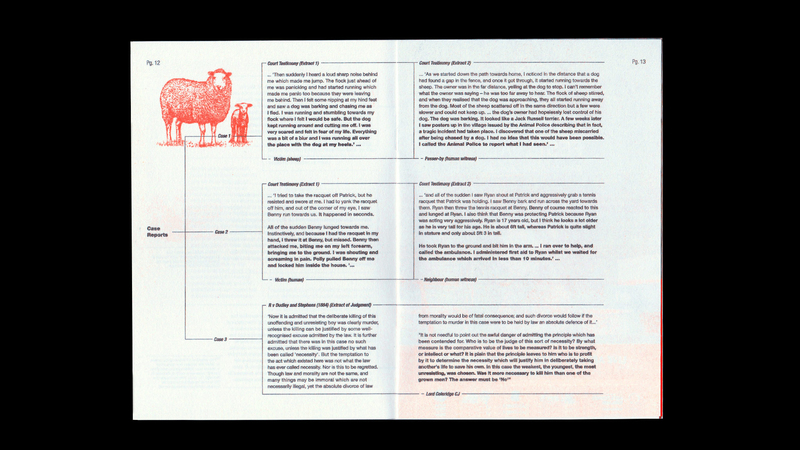 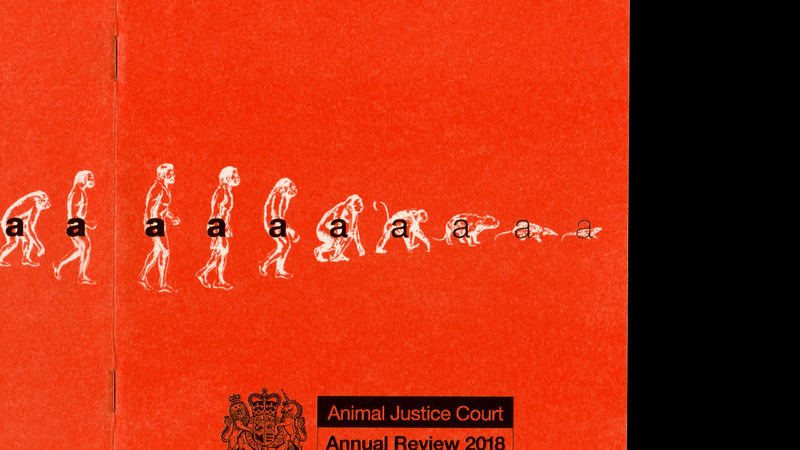 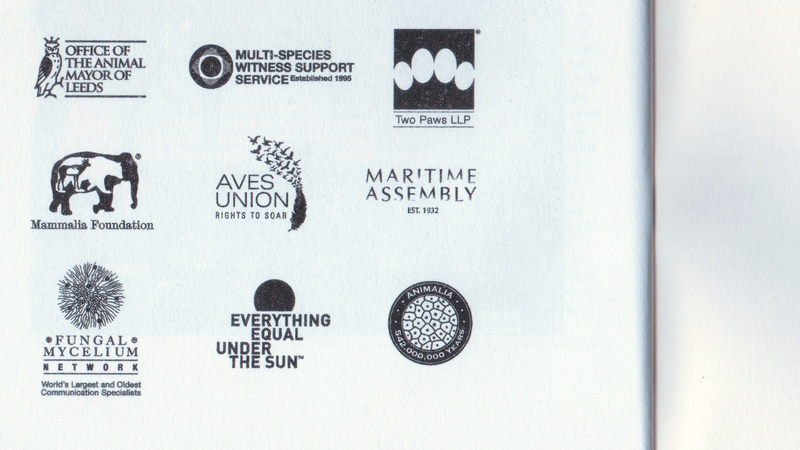 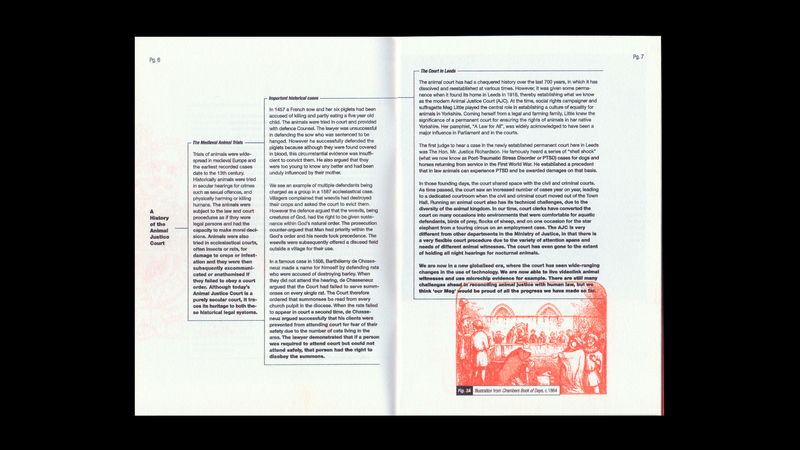 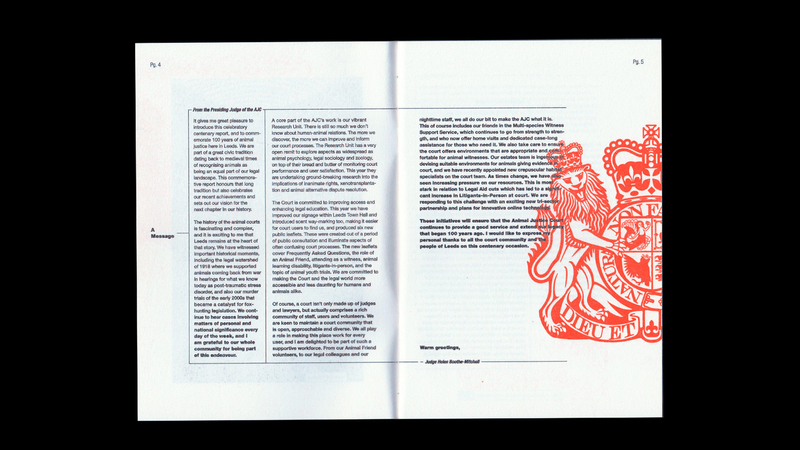 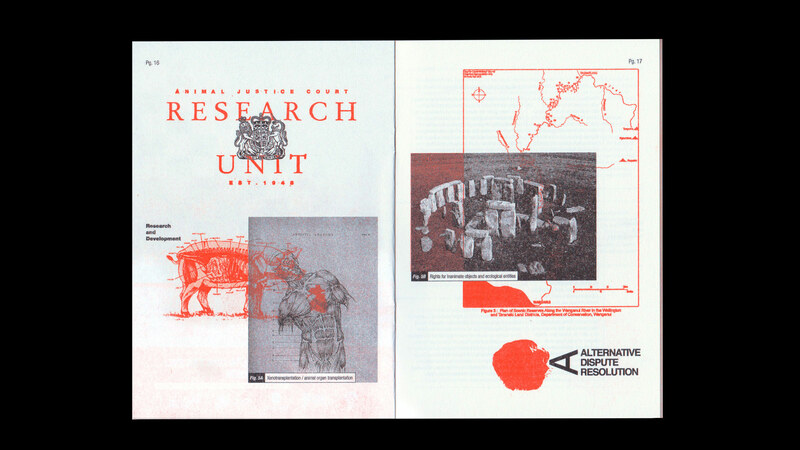 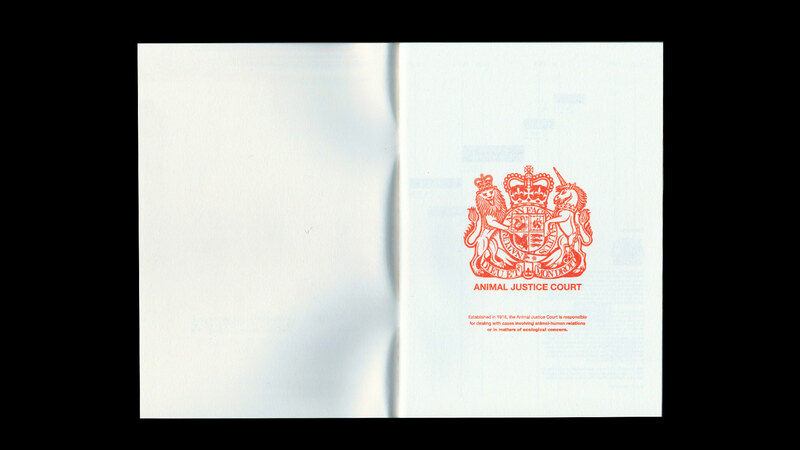 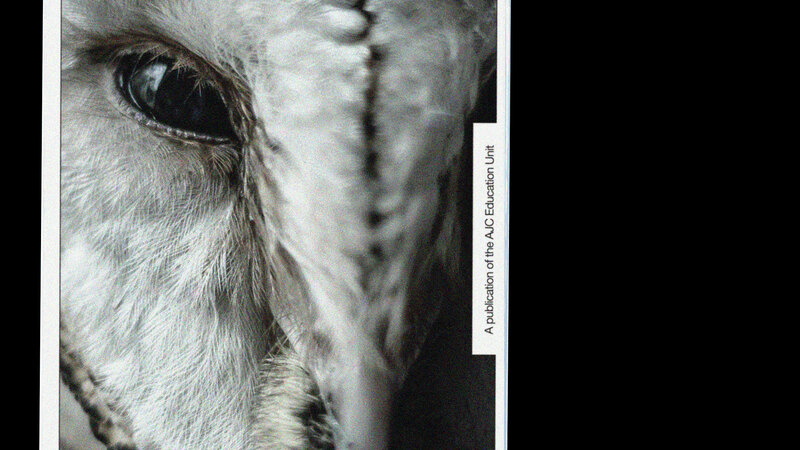 Exploring the idea of animal legal rights and evolution, the art direction of the riso-printed AJC Annual Review is loosely based on ideas of evolution/de-evolution and visual signifiers from taxonomy/evolution charts. 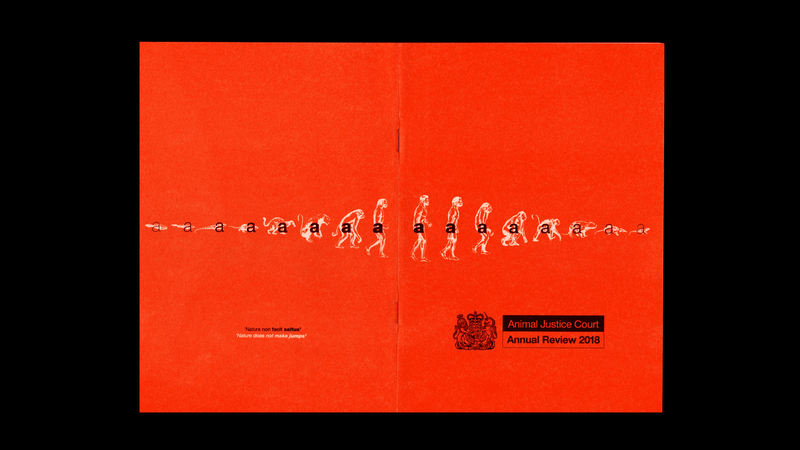 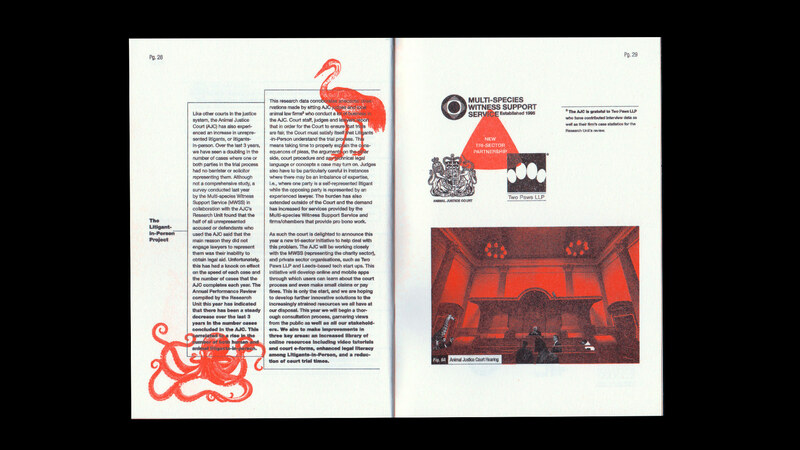 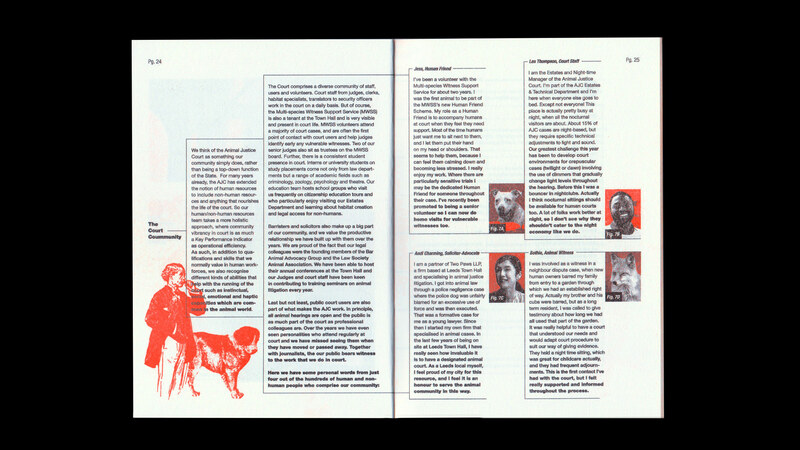 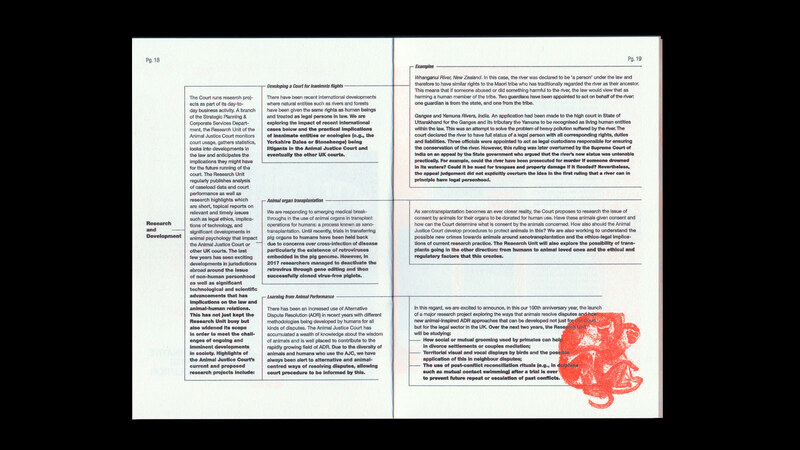 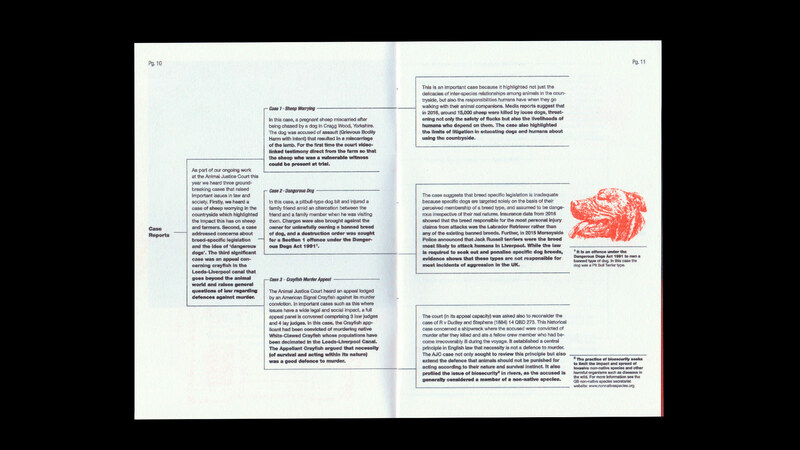 The cover of the review features a bolding sequence of the character 'a' set in Helvetica Neue, juxtaposed with images of creatures of different evolution stages, drawing on the parallel that the 'tail' of Helvetica's 'a' disappears as it bolds. 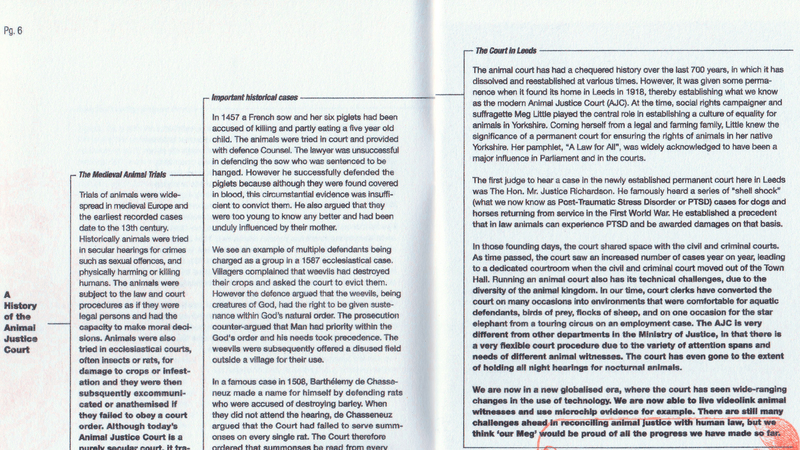 This bolding device is applied throughout the text in the review subtly, with each paragraph's text slowly 'evolving' with increasing font weight. 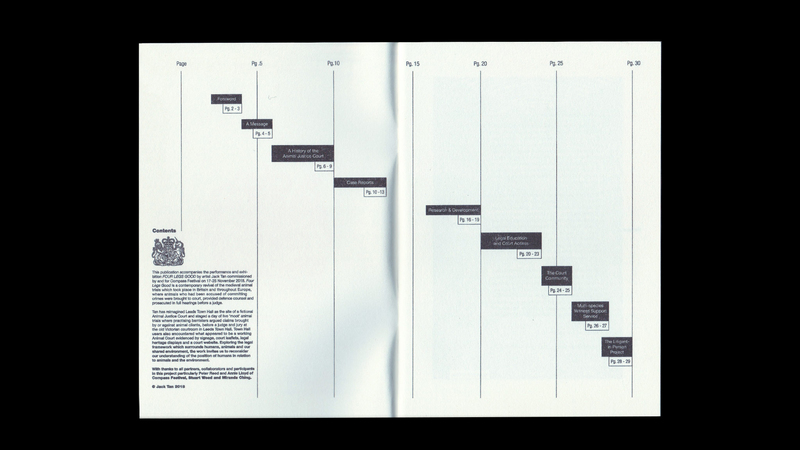 Inspired by cladograms from taxonomy diagrams, lines resembling cladograms are used in the review as column separators as well as to guide the reading flow. 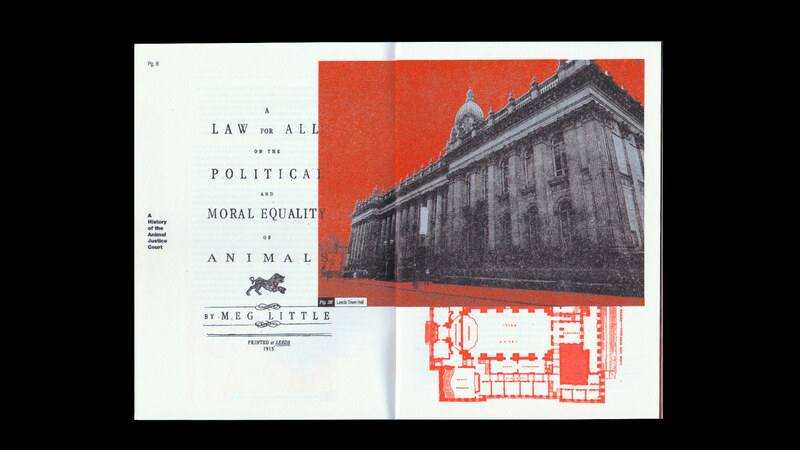 In this speculative universe of Tan's artwork, it is posited that reading conventions for animals are slightly different from our human-centric reading systems and thus information is designed to flow horizontally as well as vertically. 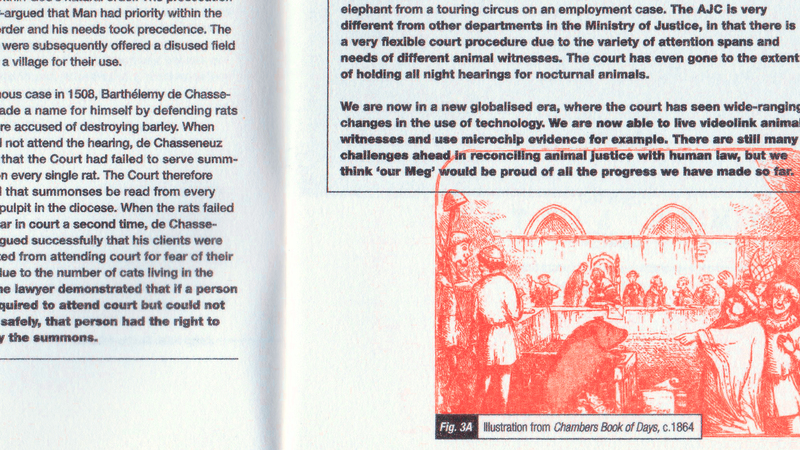 Titles of chapters are positioned on left page edges and reads from left to right across pages for each section. 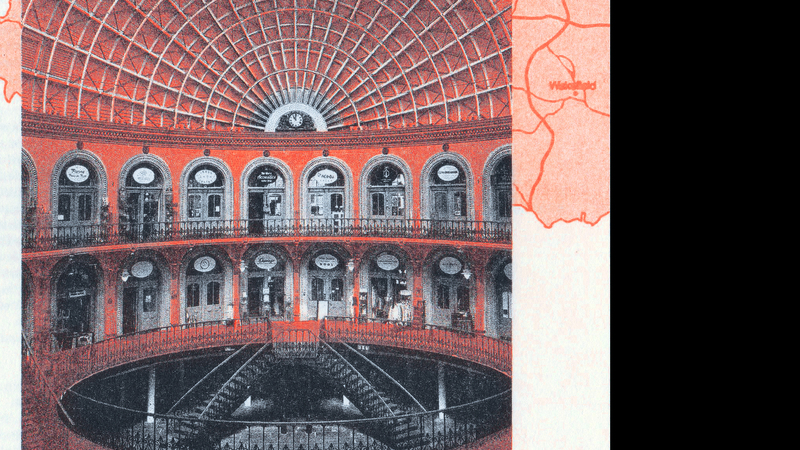 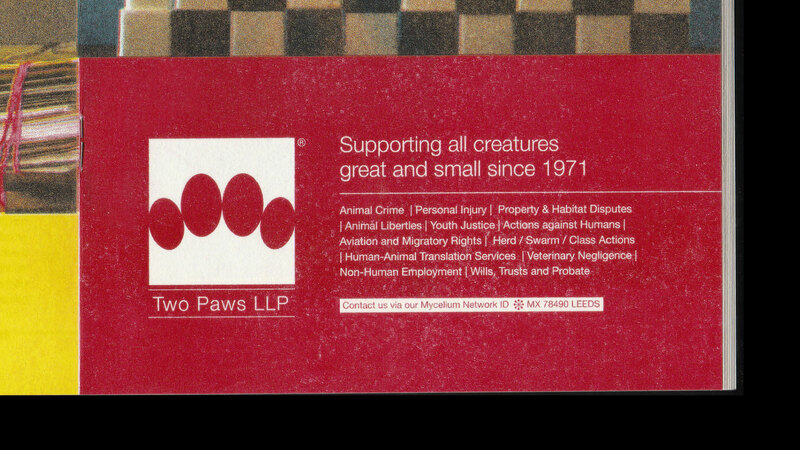 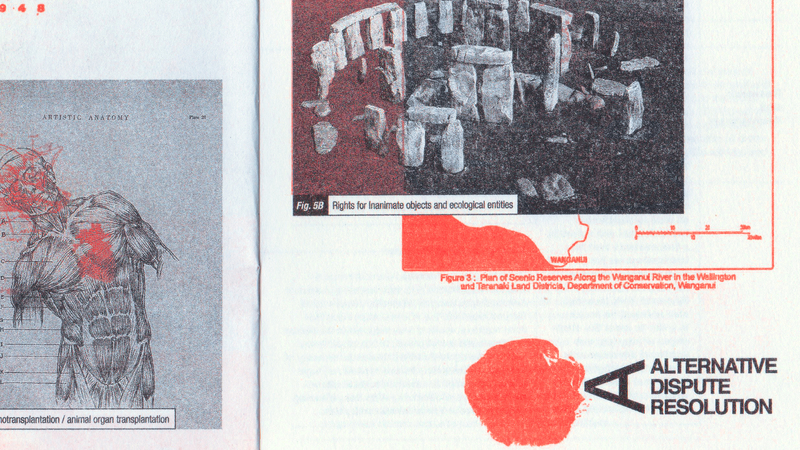 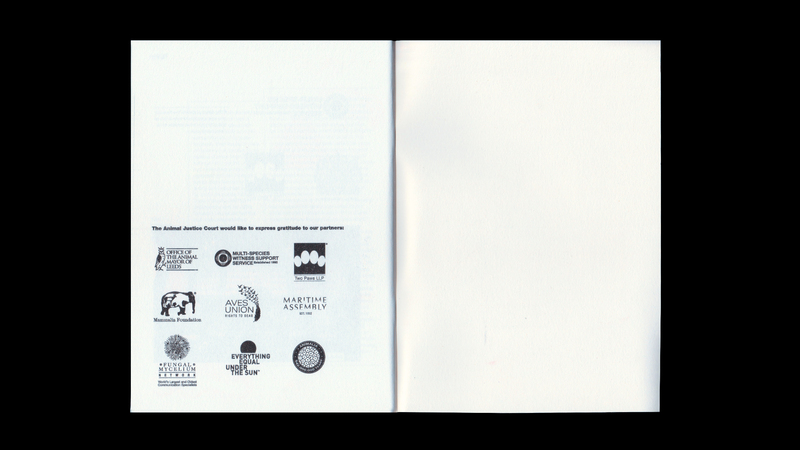 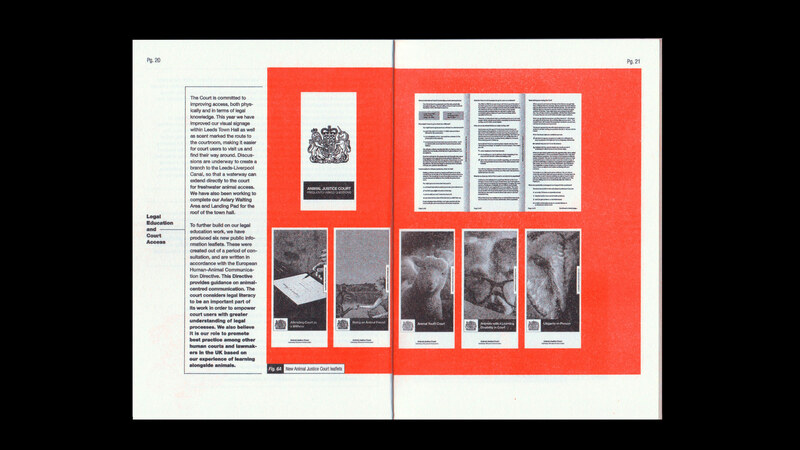 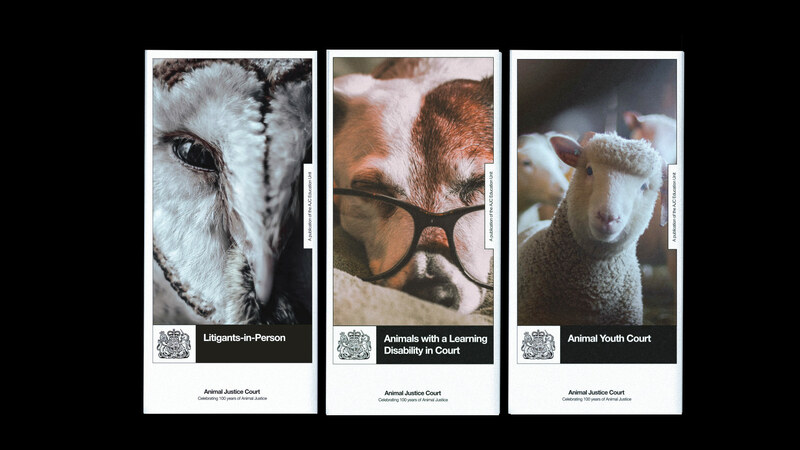 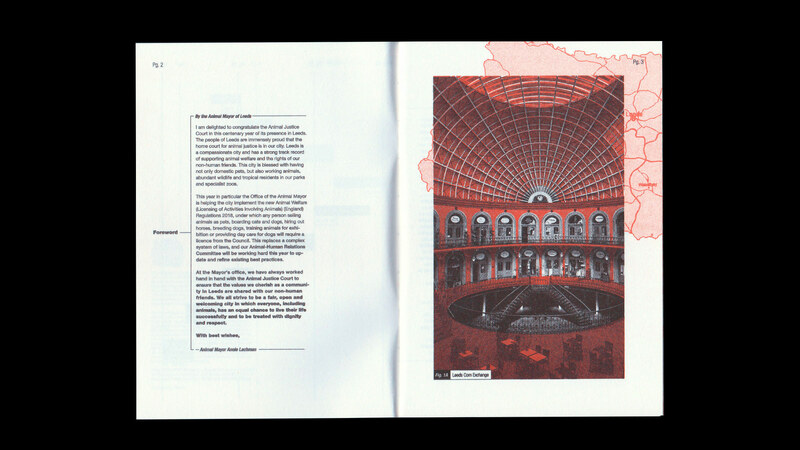 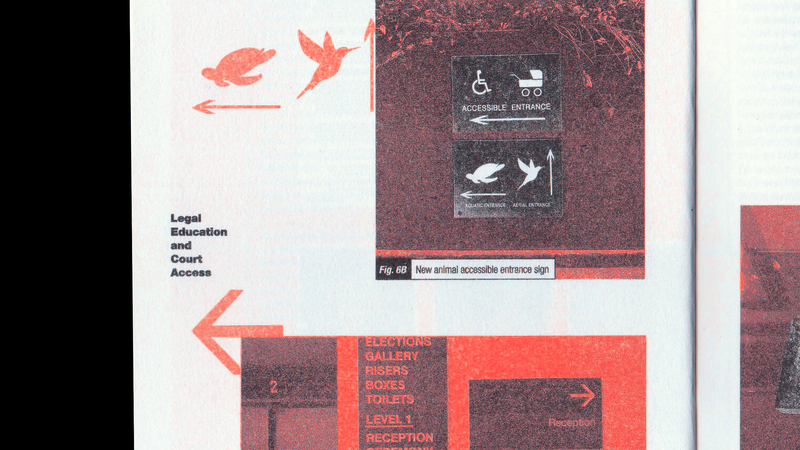 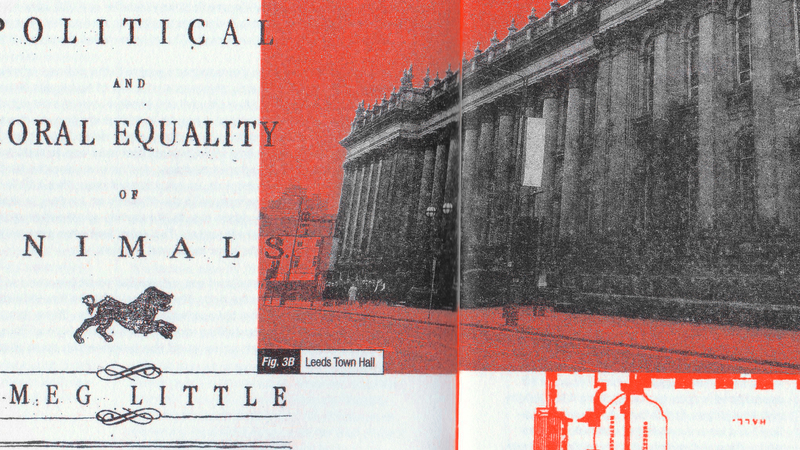 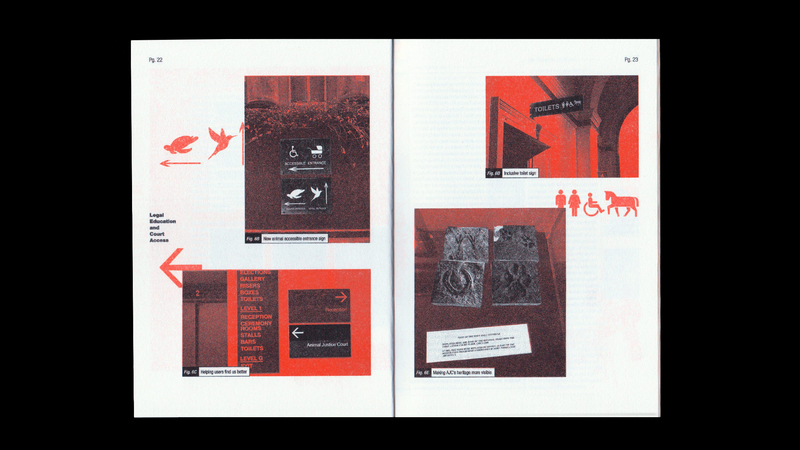 Other printed collaterals include a set of 6 AJC brochures and posters with information on animals hearings, communication materials for fictional animal-law advocacy groups/legal/corporate entities as well as fake AJC wayfinding signages designed to look like existing signages in the Leeds Town Hall, for a (tongue-in-cheek) fully-immersive experience. 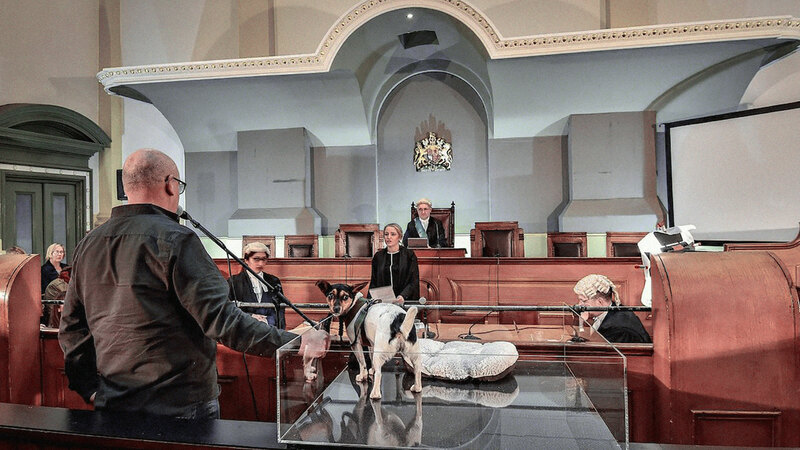 Photograph credit: Andy Garbutt/CAG Photography for the Telegraph.